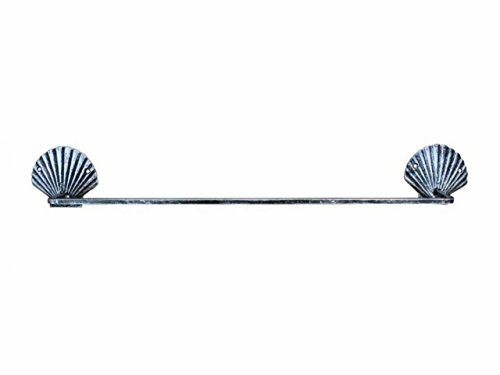 This antique silver cast iron shell bath towel holder 28 inch is perfect for any nautical inspired bathroom. It adds charm to any nautical room, while impressing your guests with their substance and thoughtfulness. Ideal for hanging toilet paper, this durable towel holder 28 inch is crafted from cast iron. Easily mountable, display this decorative holder to show those who visit your home the Affinity for the Sea-Faring lifestyle. If you have any questions about this product by Hampton Nautical, contact us by completing and submitting the form below. If you are looking for a specif part number, please include it with your message. Anniutwo Adventure,Sports Ttowel,Man Flying Colorful Balloons in The Sky on Clouds Miracle Paint Print,Absorbent Towel,Coral Blue Size: W 12" x L 35.5"